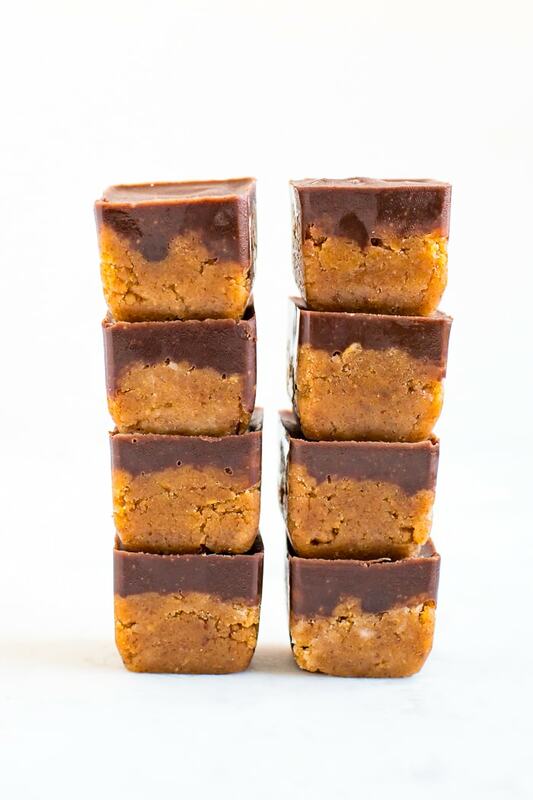 Get in your daily collagen with these two layer, fudgy pumpkin collagen bites. These collagen bites are no bake and high in protein — a double win in my book. 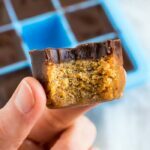 I shared these easy fudgy collagen bites over on Instagram… and the crowd went wild! But for real, this was a fan favorite so I knew I needed to add it the recipe to my blog. if you’re like me, your bookmarked Instagram posts get a littttle overwhelming and disorganized so it helpful to have a blog post version of the recipe as well. I’ve been taking collagen peptides daily and to be honest, it’s one of the only supplements that I’ve been able to stay pretty consistent with… mainly because it’s tasteless and I can add it to just about anything. I typically add it to my morning cup of coffee and I’m happy to report that I’ve seen a TON of great benefits, the most noticeable being my skin looking extra healthy and my hair and nails grow super fast. I was inspired to make a new recipe using collagen peptides because I wanted something a little more versatile than my 2-ingredient protein coffee and I know some of you don’t drink coffee. Are you curious about collagen? I already wrote a blog post about what collagen is, which brands I recommend and some of the most common questions I see around collagen so definteily check that out if you’re new to collagen. Now let me introduce you to my new favorite way to get my daily dose of collagen in. There are two layers: pumpkin and chocolate. I mean, does it get any better than that?! 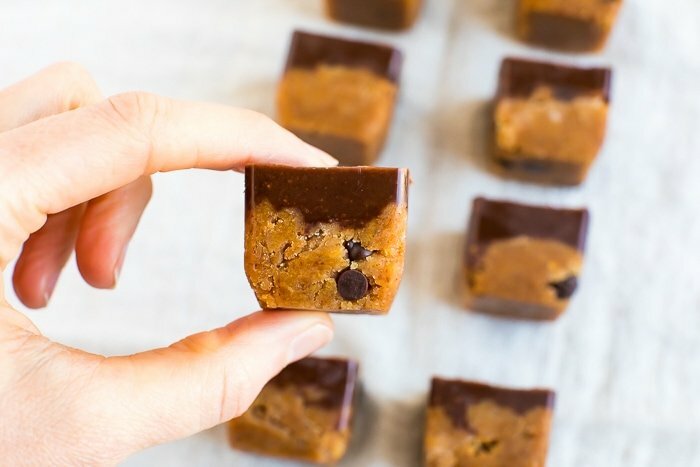 These are soooo simple to make and require zero baking. I know pumpkin is more of a fall flavor but I can already see myself enjoying these year round. 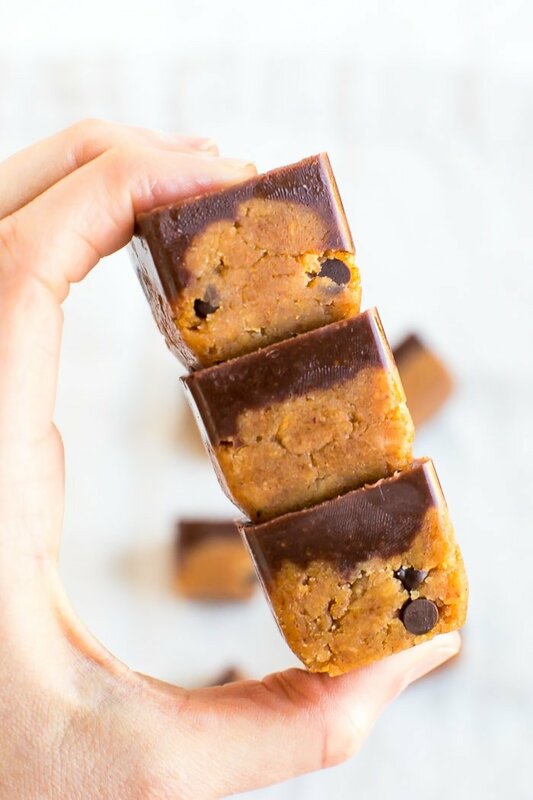 Two layer, fudgy pumpkin collegen bites that you better believe I’ll be making year round. 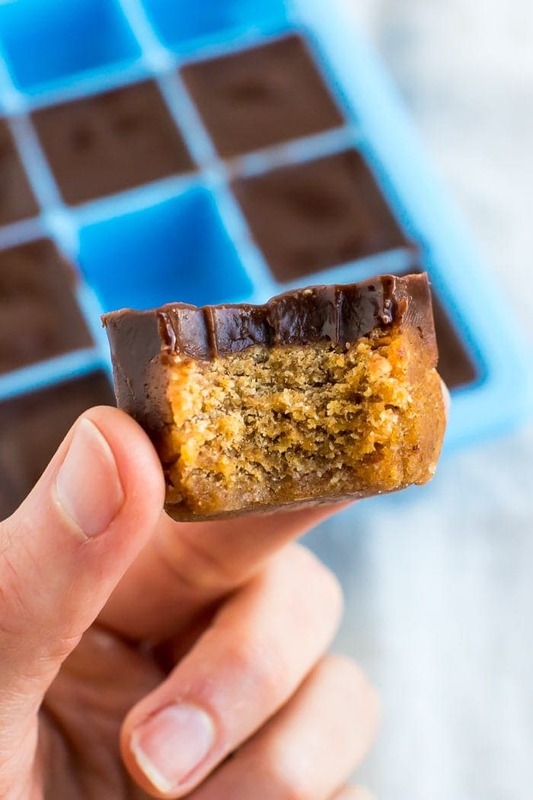 These bites are no bake and high in protein — a double win in my book. Grab two bowls, mix the pumpkin mixture in one and the chocolate mixture in another. Scoop pumpkin mixture into the cavities of a silicon ice cube tray, filling each about halfway and press mixture down. Pour a thin layer of chocolate on top of each until all are covered, then go back and add more chocolate to each until you run out. Place tray in the fridge to harden for 20-30 minutes and enjoy. Store leftovers in the fridge and eat 1-2 bites a day. Makes 6-8 bites. The post Fudgy Pumpkin Collagen Bites appeared first on Eating Bird Food. 1 Roast the turkey wings and vegetables: Preheat the oven to 450ºF. In a roasting pan, combine the turkey, onions, carrots, celery, and garlic. Sprinkle with the oil, and toss with your hands to coat with the oil. Roast the turkey and vegetables, stirring occasionally, for 1 1/2 hours, or until the meat and vegetables are well browned. 2 Make the stock: Transfer the turkey, onions, carrots, celery and garlic to a large pot. Pour 2 cups of the bone broth into the bottom of the roasting pan and set the pan over medium heat. Bring to a boil and stir with a flat wooden spoon to scrape up and release the brown bits. Pour the broth, including any accumulated fat from the pan or vegetables that stuck to the bottom, into the pot with the turkey and vegetables. Add the remaining bone broth, water, parsley, thyme and bay leaf. Bring the stock to a boil over medium heat. Adjust the heat so the stock maintains a gentle simmer. Simmer for 2 hours. Set a large strainer over a large container, and strain the stock into it. When the stock settles, skim off the fat with a ladle, transfer it to a bowl, and reserve it for making the gravy. Alternatively, if time permits, refrigerate the stock overnight. The fat solidifies and is easier to remove. Also, don’t be surprised if your stock turns into jelly overnight in the fridge. That’s a good thing! 4 Make the gravy: Reheat the stock if you have refrigerated it overnight. Spoon 1/2 cup of the reserved turkey fat into a large saucepan and set the pan over medium heat. Slowly whisk in the flour, and cook, stirring, for about 2 minutes to cook the flour. Slowly add 4 cups of stock while whisking the roux. Simmer, whisking often, until thickened, another 2 to 5 minutes. Thin with additional stock if desired. Add additional stock, if you like, to bring the gravy to the consistency you prefer. Add the salt and pepper and taste. Add more salt, if you like. 5 Freeze or refrigerate the gravy: Let the gravy cool for about 30 minutes and transfer it to a storage container. Refrigerate for up to 4 days or freeze for up to 4 months. Reheat in a saucepan when ready to use. Frozen gravy made without milk or cream like this gravy should not separate upon reheating. Oh, the humble hot dog! It’s maybe the most iconic American children’s food, and with good reason. Hot dogs are easy to cook—actually almost all of them are precooked so you can safely eat them cold out of the package, if that’s your thing. They are easy for kids to eat either with hands or chopped up into pieces. They are also pretty darn delicious. WHAT HOT DOGS TO BUY? My kids will eat pretty much any hot dog, but if I’m making these for my dinner as well, I want a good quality hot dog. I prefer to buy all-beef hot dogs with a natural casing on them so they have some snap to them. Hebrew National is my go-to brand if it’s available, and Nathan’s is a close second. WHY BAKE YOUR HOT DOGS? To make sure the hot dogs have a little snap to them, I recommend searing them in a skillet before baking them. Sure, it takes a few minutes, but it does add some nice texture to the dog. Then baking the hot dogs allows the cheese to melt and the bun to get crispy on top. It’s a beautiful, and simple, combo! Topped with cheddar cheese and diced onions, the hot dogs bake up beautifully (I recommend a top-cut bun for easier positioning in the baking dish). Top with any and all toppings you wish and serve them with a steamed veggie. I used cheddar cheese and chopped white onions, and after a few minutes in a 350°F. oven, dinner is done! What to serve with your hot dogs? To round out the plate, I recommend serving these with a steamed vegetable of some sort. I went with peas, as it’s an easy win for my kids (they actually eat them frozen), but steamed broccoli would be great also! Just something green! I can eat a cheesy hot dog as-is with nothing else and be pretty content. But I have nothing to do while the hot dogs bake anyway, so I like to chop up a quick cheater giardiniera (a.k.a. fancy Italian relish) with common store-bought pickled veggies. I use a mix of dill pickles, spicy pickled cauliflower, and banana peppers, which adds a zesty crunch and cuts through some of the richness of the hot dogs. I chop the mix pretty finely since it’s going on the dogs. I recommend making a double batch and keeping it in the fridge. Giardiniera is pretty solid on any deli sandwich, also. These hot dogs were a science class for my kids. The first thing they wanted to do to these beautiful hot dogs was completely deconstruct them. They both scraped the toppings off, pulled the hot dog out, and ate everything separately. The key? They ate everything. A bite of hot dog there, a bite of bun here, and smiles all around, although they didn’t try the Dad Add. I tend to worry about my littlest one choking because she tends to try to shove WAY too much food in her mouth at once, so I took the extra step of slicing her dog up into thin slices. Hot dogs are a pretty easy win for most kids so maybe explore different toppings with your kids such as spicy mustard, the Dad Add, or just keep it simple and count this as a surefire dinner win. Let’s be real. We might make a big deal about the amazing golden hue of this year’s roast turkey and go back for seconds of Grandma Dola’s famous green bean casserole, but most of us are really just waiting a polite and acceptable period of time until we can hit the dessert table. We’re just here for the pie, thanks. Here’s my advice — give yourself a break when it comes to Thanksgiving dessert. Make one or two traditional pies, but then make some room for something new on the table. Who knows — your picky brother might just discover a new favorite! Jump to Your Favorite Pie! In any case, chicken tenders can be useful to have around, especially stored in the freezer for when you want a quick meal. As the name implies, they are tender, having been cut from chicken breasts, and a little soaking in buttermilk helps tenderize them even further. Chicken tenders are sold packaged as such, or you can make your own by saving and freezing them when you prepare chicken cutlets. Just find that little strip on the side of the chicken breast half and cut it or pull it off. I make my breadcrumbs from scratch, because we often have leftover hard ends of French or Italian loaf bread hanging around, which are so easy to chop up and pulse in the blender. Sure, you could use store-bought marinara sauce for dipping, but it’s so easy and quick to make your own — and it tastes better! Just sauté some chopped onions and garlic, and add tomato paste and canned tomato sauce or crushed tomatoes. Blend it all up in a blender, and it’s ready to serve. The sauce can also be made ahead and kept in the fridge for up to a week. If you have any leftover, it’s great for serving with pasta or layering into a casserole. I’m using Italian seasoning with the breadcrumbs, you could just as well pick one herb, like thyme, and go with that. Or add some grated Parmesan. For a lemony flavor you could soak the chicken in a little lemon juice instead of buttermilk. You can make a substitute for buttermilk by adding a tablespoon and a half of lemon juice or vinegar to 1 1/2 cups of milk and letting the mixture stand for 10 minutes. 1 Soak tenders in buttermilk for 15 to 30 minutes. While the tenders are soaking, make the tomato dipping sauce. 2 Make the tomato dipping sauce: Heat the olive oil in a pot over medium-high heat. Sauté the onions, stirring often, until translucent, about 3 minutes. Add the garlic and cook another minute. Add the tomato paste, mix well and cook for 1 to 2 minutes more. The tomato paste should darken to a brick-red color. Add the tomato sauce or crushed tomatoes, salt and sugar and bring to a boil. Cook this for 5 minutes if using tomato sauce, 10 minutes if using crushed tomatoes. 3 Blend the dipping sauce: Put the sauce into a blender and purée until smooth. Hold your hand over the blender lid to keep it from popping off, and start the blender at a low setting and work up to the highest. The sauce will keep in the fridge for up to a week. 4 Heat oven to 500°F and line a roasting pan with foil. Brush the top of the foil with vegetable oil to help prevent sticking, or use a Silpat sheet. 5 Coat the tenders with breadcrumbs: Mix together the breadcrumbs, Italian seasoning, and salt in a shallow bowl. One by one, remove the chicken tenders from the buttermilk and place in the bowl with breadcrumbs, coating them on all sides with the breadcrumbs. Place on the roasting pan, spaced slightly apart. 6 Bake the tenders: Drizzle a little melted butter over each chicken tender. Place the pan in the oven and bake for about 12 minutes, until the chicken is cooked through and the pieces are lightly browned. 7 Serve with a bowl of the sauce for dipping. Hello! All photos and content are copyright protected. Please do not use our photos without prior written permission. If you wish to republish this recipe, please rewrite the recipe in your own unique words and link back to Herbed Chicken Tenders with Tomato Sauce on Simply Recipes. Thank you! 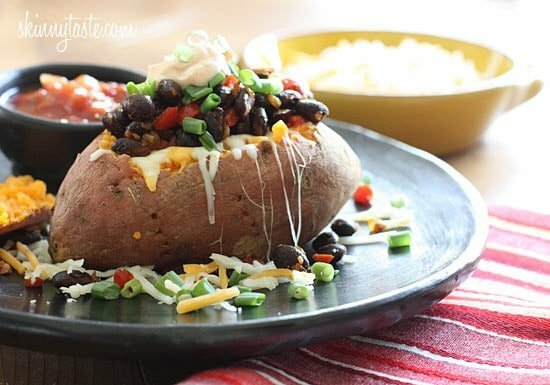 Loaded Vegetarian Baked Sweet Potato are Mexican-inspired, loaded with zesty black beans, melted cheese, salsa with a dollop of cream. What can be better than a 20 minute meal! 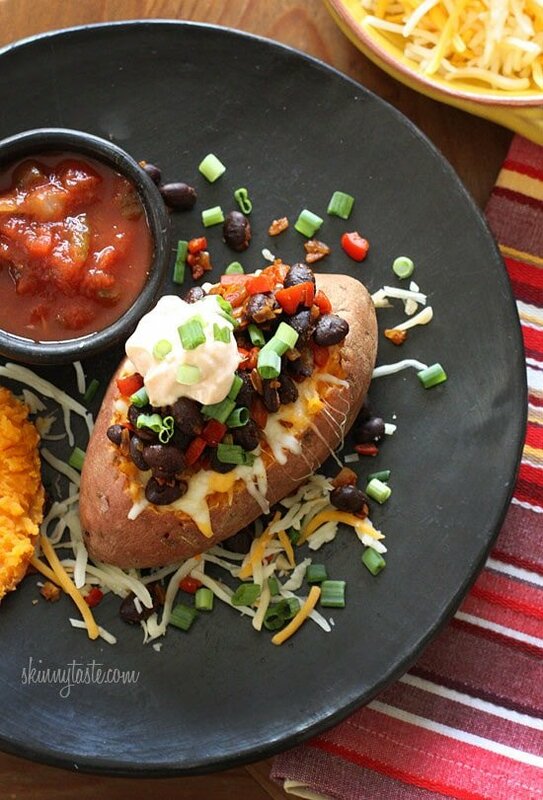 Loaded baked sweet potatoes are so quick and easy to make. A few of my other favorites are Italian-Style Stuffed Sweet Potatoes, Sloppy Joe Baked Sweet Potatoes, and Cheesy Baked Sweet Potato Skins. This recipe is a guest post from The Picky Eater. I met Anjali in San Francisco a few years ago; she’s a sweet blogger who I instantly connected with, she is also a vegetarian and shared this delicious (yes, I tested this myself and now make it all the time) recipe with us, perfect for meatless Monday! Hi Everyone! My name is Anjali Shah and I blog over at The Picky Eater, where I write about healthy recipes and easy-to-make family meals. I test all of my recipes on my “fast food loving husband,” who, prior to meeting me, ate a diet of frozen pizzas and Taco Bell, so any recipe that makes it on to my blog is “husband approved”! 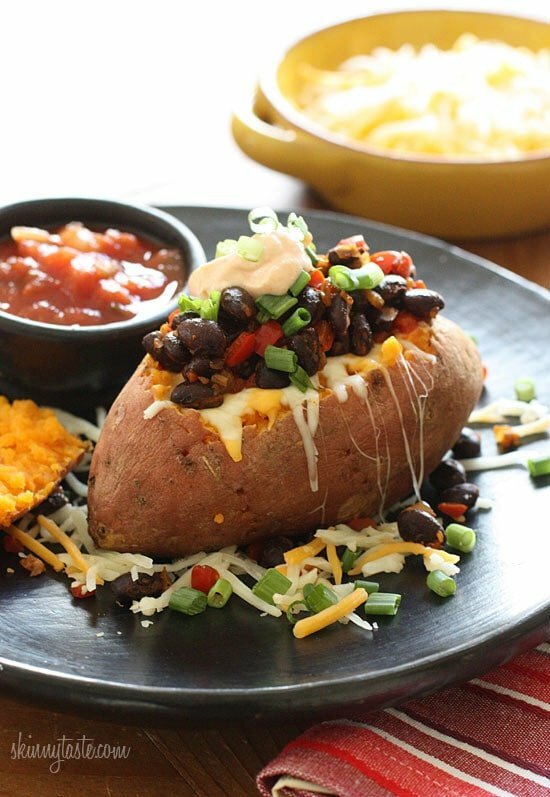 Today I’d like to share one of my favorite recipes – my Loaded Baked Potato Makeover. My healthy swaps include: sweet potatoes instead of russet, “loaded” toppings like black beans and veggies sautéed with spices, and a dollop of cream (which is my favorite swap – 0% Greek Yogurt for sour cream!) The husband usually can’t tell the difference, especially when I spice up the yogurt with some taco seasoning. This meal is delicious and takes only 20 minutes to make, which is why I love making it after a long day at work – I know I’ll have something yummy in my stomach in the same amount of time it would take to pick up takeout. The husband loved it too, and it has since become a staple weeknight meal in our house. I hope you enjoy it as much as we do! 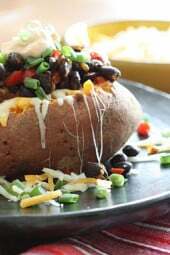 Baked Mexican style vegetarian loaded sweet potato loaded with zesty black beans, melted cheese, salsa with a dollop of cream. What can be better than a 20 minute meal! Poke holes in the potato with a fork, cook on your microwave’s potato setting until potatoes are soft and cooked through (about 8-10 minutes on high for 4 potatoes). If you don’t have a microwave, bake about 45 minutes at 400°F. Slice the potato lengthwise down the middle or as I did in the photo, use a fork to pierce the top in an oval shape, then remove the top of each potato. Top with 2 tbsp shredded cheese, 1/3 cup of black bean mixture, 2 tbsp Greek yogurt mixture and 2 tbsp salsa of salsa. 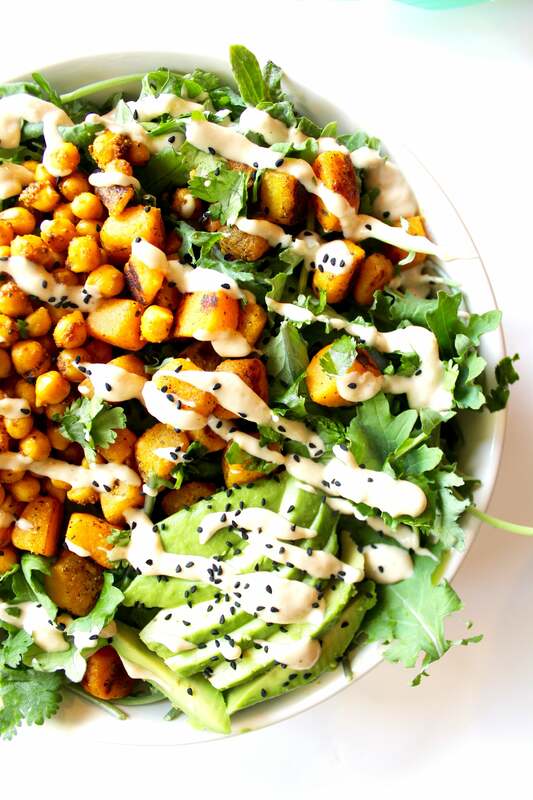 Buddha bowls seem to be the new hype all over Instagram. They are supercolorful, full of macronutrients and micronutrients, and they're delicious. If you haven't heard of a Buddha bowl before, it's basically a bowl piled so high with all your favorite foods that it looks like a belly. They also tend to be plant-based, vegan or vegetarian. But don't be fooled, they can still be high in protein. The Buddha bowl has six components. You have your leafy greens, raw or cooked veggies, healthy grains or complex carbs, protein, fats, and a sauce to top it all off. Combining my favorite meal and the cuisine I hold closest to my heart, here is a recipe for a North African inspired Buddha Bowl. In Libya, we make couscous using ingredients like chickpeas, pumpkin, green pepper, potato, and zucchini. It's also very common to use spices like cumin, ginger, cinnamon, paprika, and coriander. In fact, Morocco is famous for their spice mix called Ras El Hanout, which just means the head of the shop. Also harissa, or a hot red chili paste, is a huge staple in Libyan cuisine. Although North African food is heavily centered on proteins like lamb, beef, and seafood, it can be tweaked a little to fit the so-called definition of a Buddha bowl. 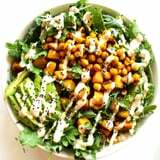 For our protein, we have roasted chickpeas, pumpkin for carbs, lemon tahini dressing for healthy fats and more protein, baby kale as our greens, avocado because why not, Hab al Barakat (blessed seeds or black seeds), and chopped cilantro for garnish. Add olive oil to a frying pan over medium-high heat and add chickpeas. Season with paprika, turmeric, cinnamon, cumin, and salt, and sauté until slightly browned — about 5 minutes. Set chickpeas aside. In the same pan, cook your ghee over medium-high heat and add the pumpkin. Season and sauté just like before. The pumpkin takes a bit longer to soften and caramelize — about 10 to 12 minutes. Once it's done, set it aside as well. In a small bowl, add the tahini, water, lemon juice, vinegar, paprika, garlic, and salt, and mix well until you have a dressing. In a large bowl, add the kale or any leafy greens of choice. Top with the chickpeas, pumpkin, avocado, cilantro/coriander, black seeds, and dressing. Massage it all together with your hands to really break down the kale and get it seasoned evenly. Serve and enjoy! 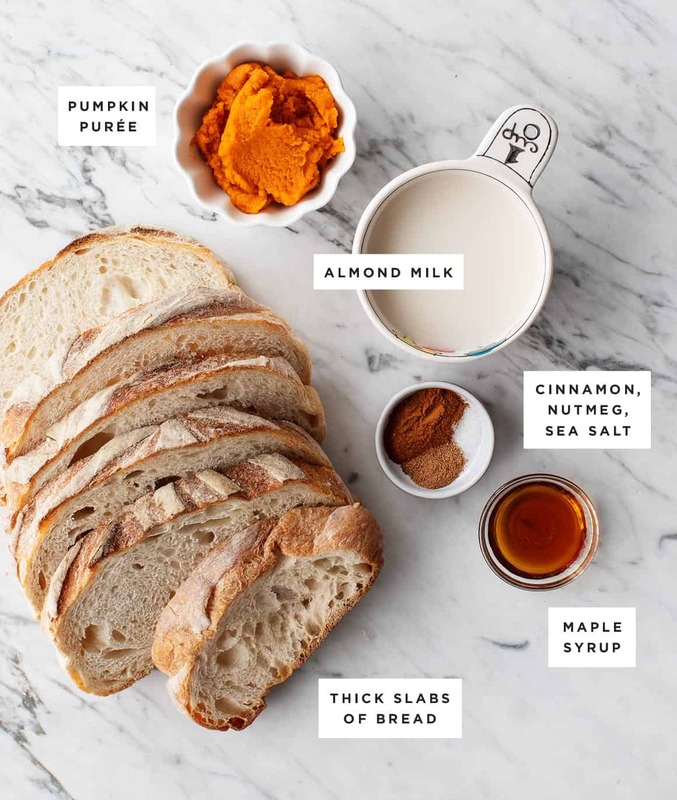 This is made with just a handful of ingredients, see above. The most important one is the bread. 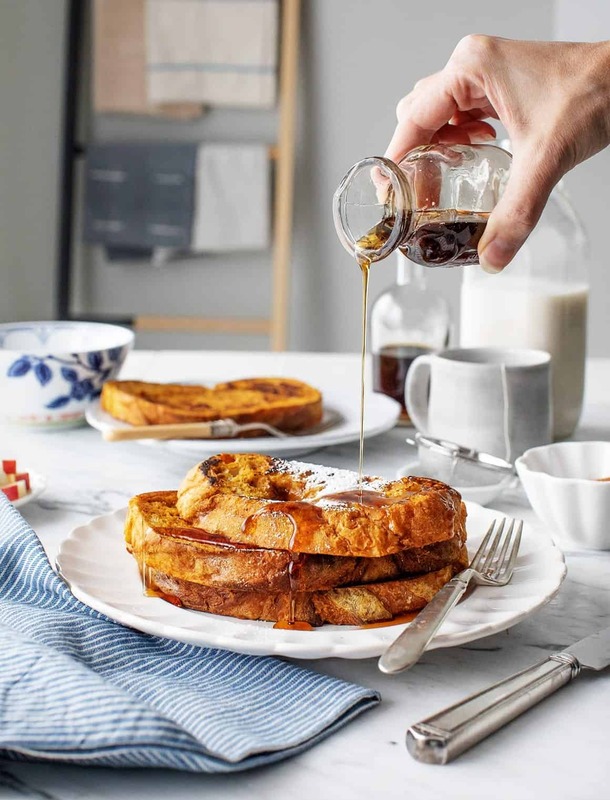 Your french toast will only be as good as your bread, so grab a nice sourdough or ciabatta loaf and slice it into thick slabs. Day-old bread is preferred, just stay clear of thinly sliced sandwich bread. 1 Roast the squash: Preheat the oven to 425°F. On a rimmed baking sheet, combine the squash with olive oil, salt, and pepper on a rimmed baking sheet, and toss to coat. Roast for 20 minutes, tossing half way through to evenly brown. When it’s ready, the squash will be soft and some of the edges will have browned. 2 Cook the pasta: Meanwhile, bring a large pot of salted water to boil and cook the pasta to al dente, or according to package directions. Drain well and set aside. 3 Fry the bacon: In a large, deep skillet (I used cast iron), put the bacon in a cold pan and cook over medium heat until crispy. Remove from the skillet and drain on paper towels. 4 Cook the shallots: Place the skillet back on the stove, but with the heat turned off. Drain all but about 2 tablespoons of the bacon grease. Add the shallots and cook in the residual heat from the skillet; this helps prevent the shallots from burning. If they don’t seem to be cooking fast enough, turn the heat to medium-low and cook for just a couple of minutes until they start to soften and become aromatic. Transfer the cooked shallots to a large bowl. 5 Combine the bacon, shallots, squash and pasta: After the bacon cools, cut it into small pieces using kitchen scissors (or using a chef's knife), and combine with the shallots in a large bowl—or you can use the stockpot you cooked the pasta in (I like to do this if it's just me and the boys). Add the pasta and toss to combine. When the squash comes out of the oven, add the squash to this bowl and toss gently together. 6 Brown the butter: In a small saucepan, melt the butter over medium heat. Stir it constantly and keep an eye on it so it does not burn. (See here for full instructions on how to brown butter.) It will start to crackle, foam, and smell nutty. The color will deepen to a caramel/amber hue. Around when the butter stops foaming—or at least it starts to subside—and the butter turns slightly brown, add the sage leaves. Remove the saucepan from the heat as soon as the sage leaves start to curl. Pour the butter and the sage leaves into the bowl with the rest of the ingredients. 8 Combine all ingredients and serve: Toss everything gently together with a wooden spoon. Taste and add salt and/or pepper if needed. Serve immediately with freshly grated cheese over the top. If you are feeling extra decadent, add a chunk of unsalted butter or a splash of extra virgin olive oil on top when you toss, or some of the reserved bacon grease. OMG! 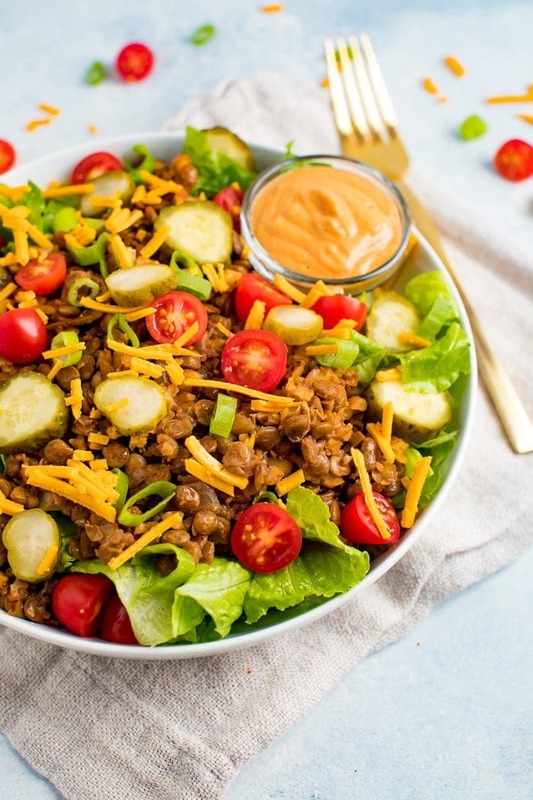 This “Cheeseburger” Salad with Special Sauce is reminiscent of a Big Mac, but so much better. It’s totally plant-based and made with lentil walnut burger meat and a cashew cream sauce. Few things are better than seeing your friends succeed. My friend Megan of Detoxinista recently released her THIRD cookbook to the world (The Fresh & Healthy Instant Pot Cookbook) and I’m so excited to share a recipe from it today! I know a lot of people are making the recipes from my blog every day, but I still love cookbooks (and have a whole collection of them to prove it) so creating my own cookbook is still a goal – and I’m always so impressed by other bloggers who have made this happen. You may remember when I shared this turkey cauliflower baked ziti from Megan’s second cookbook. It has been super popular so if you haven’t tried it yet, go check it out. Megan and I have really similar food philosophies so I was extra excited to see another cookbook come out. Plus it’s all Instant Pot recipes, which has been so fun to experiment with! While I don’t have a name-brand Instant Pot, I have the Pressure Cooker XL and it has the same functionality. We received this bad boy as a gift a few years ago and although I have shared one recipe (butternut squash and turkey chili), I haven’t fully explored pressure-cooker life yet. Honestly, many of the Instant Pot recipes you find online aren’t super healthy, which is why Megan created this cookbook. Every recipe has nutrition info, a photo, a gluten-free/vegan option and all are made without refined sugar. The purpose of her cookbook is to help you eat better and spend less time in your kitchen. Love that! 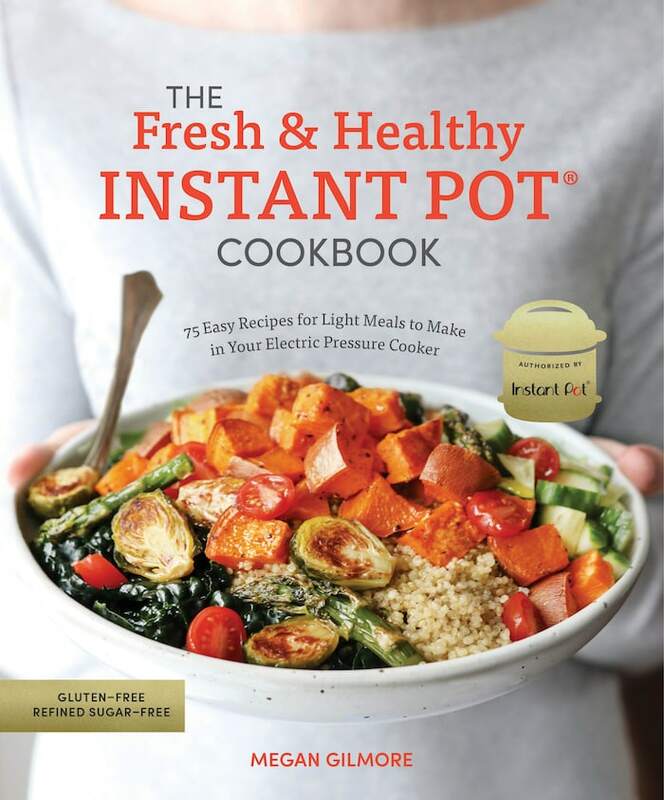 The Fresh & Healthy Instant Pot Cookbook actually has seven salad recipes in it! Who knew you could make salads with an Instant Pot? Not me. 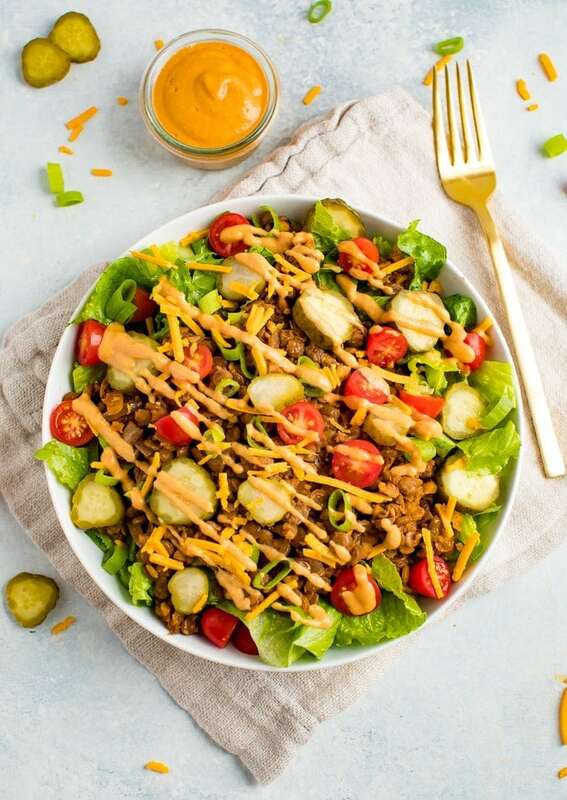 I was instantly drawn to this “Cheeseburger” Salad with Special Sauce because it reminded me of a Big Mac, aka my go-to order at McDonald’s when I was younger. I know it’s crazy to imagine me ordering and eating a Big Mac with a supersized Dr. Pepper and fries that I dipped in honey, but it’s true. From Big Macs to Bird Food I guess. 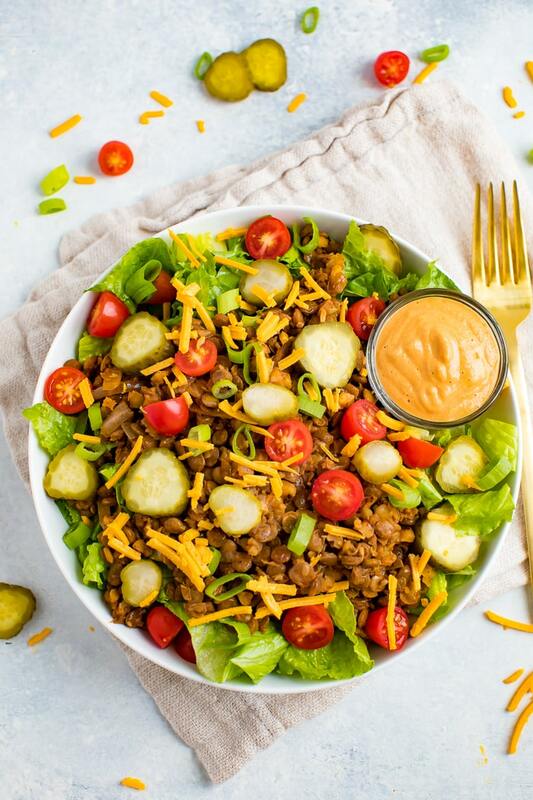 Megan’s “cheeseburger” salad actually doesn’t have beef in it at all… she created burger “meat” made from lentils, which I’m willing to bet will be a crowd favorite. 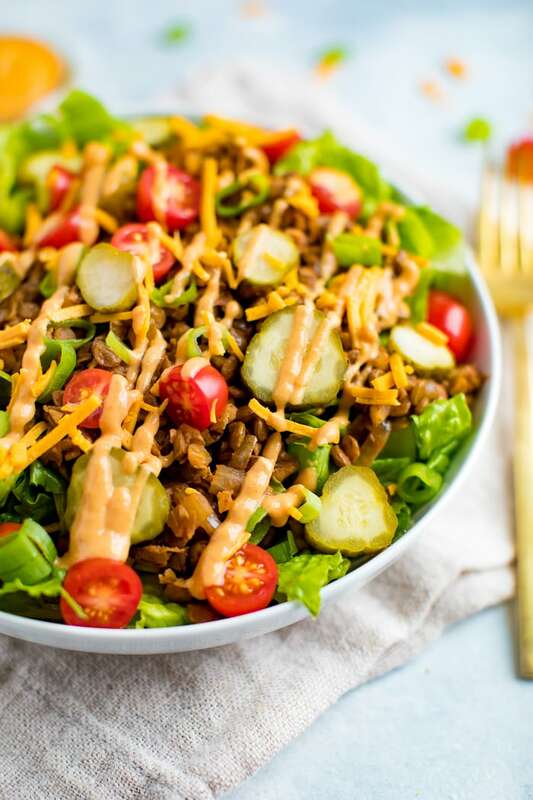 If Meatless Monday isn’t going over too well in your home, you might just need to introduce this cheeseburger salad into your meal rotation. Thankfully, Megan broke down each step into really digestible instructions. If you have never used an Instant Pot before, this cookbook will definitely help you feel comfortable with it, and this recipe is a great one to start out with. You’ll practice both sautéing and pressure cooking in the Instant Pot, which are the two key features. Just a few simple steps results in six servings – so a simple family meal or easy meal prep/leftovers for your week! Do you own an Instant Pot? If so, please share your favorite healthy Instant Pot recipe below! If you own an Instant Pot and it’s been collecting dust, I highly recommend grabbing a copy of Megan’s cookbook. There are so many awesome recipes included — everything from easy breakfasts to sweet treats. To make the burger “meat,” press Sauté and add the olive oil to the Instant Pot. Once the oil is hot but not smoking, add the onion and sauté until softened, about 5 minutes. Press Cancel to stop the cooking cycle. Stir in the garlic powder, paprika, cayenne, cumin, an black pepper while the pot is still hot. Add the green lentils and water, and stir to make sure the lentils are covered in the liquid for even cooking. Secure the lid and moves the steam release valve to Sealing. Select Manual/Pressure Cook to cook on high pressure for 5 minutes. While the lentils are cooking make the special sauce. Drain and rinse the cashews, then add them to a blender with the water, vinegar, maple syrup, tomato paste, mustard, onion, powder, and salt. Blend until very smooth and set aside. White the cooking cycle on the burger “meat” is complete, let the pressure naturally release for 10 minutes, them move the steam release valve to Venting to release any remaining pressure. When the floating device valve drops, remove the lid and stir in the salt and chopped walnuts. Fill a bowl with chopped lettuce, the burger “meat,” tomatoes, green onions, pickles, and cheese. Drizzle plenty of the special sauce over the top before serving. Store leftovers in three separate airtight containers- – for the dressing, the burger “meat,” and the vegetables — in the fridge for 1 week. 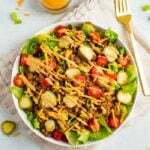 The post “Cheeseburger” Salad with Special Sauce appeared first on Eating Bird Food.